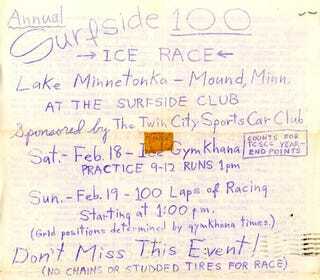 Minnesota, February 1967: Let's Go Racing! Those crazy Minnesotans aren't going to let a little 20-below weather stop them from taking their Saabs and MGAs out for some racing, you betcha! My grandfather, a proud St. Paul native, was serious about rally madness and ice-racing lunacy back in the 50s and 60s, and he'd probably still be doing it today at age 91 if his eyesight were a little better and he still had the ol '356 (or the Corvair... or the Dauphine...). He's handed over some of his racing memorabilia to me, including his Curta Peppermill and some of his old Twin Cities Sports Car Club newsletters. Here's the February 1967 TCSCC newsletter, which shows how those tough-guy Minnesotans pretended they weren't freezing their nodules off in ludicrous weather conditions. Uff da! Yeah, it's not as cool as the 8mm movie film I have of actual races, but I haven't had a chance to get them digitized yet.